Do you need a versatile garden shredder that can take care of all your garden debris quickly and quietly? The 2400W silent shredder has your garden waste disposal needs covered. Whether you are clearing leaves, small branches, bark or roots, you'll appreciate how efficient and powerful this model is. Forget the trips to the local tip - simply feed organic matter into the shredder. 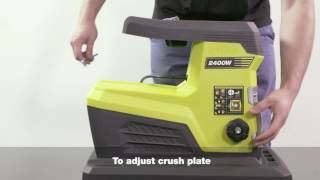 RYOBI tools and hardware have a reputation for quality manufacturing, and this 2400W silent shredder is no different. With proper operation and maintenance, you'll be recycling your organic waste with ease well into the future. This shredder is available through Bunnings Warehouse - call or visit your local store to check stock.